During the War of the Austrian Succession, fought in 1740-48, alliances across Europe formed, fighting for or against Austria. Several events of this war were commemorated on Chinese porcelain decorated in Holland. One of them was Prince William of Orange's appointment as Stadtholder of the United Provinces; another was the battle of Dettingen, where George II led his troops, who fought together with Austria against France, into battle. Yet another subject is the battle by Charles Alexandre, Archduke of Austria and Governor of Holland, who fought on the side of the Dutch during the War of the Austrian Succession. His equestrian portrait is very similar to the one of George II in this example. For further explanation see Helen Espir, European Decoration on Oriental Porcelain 1700-1830, London, 2005, pp. 170-171. 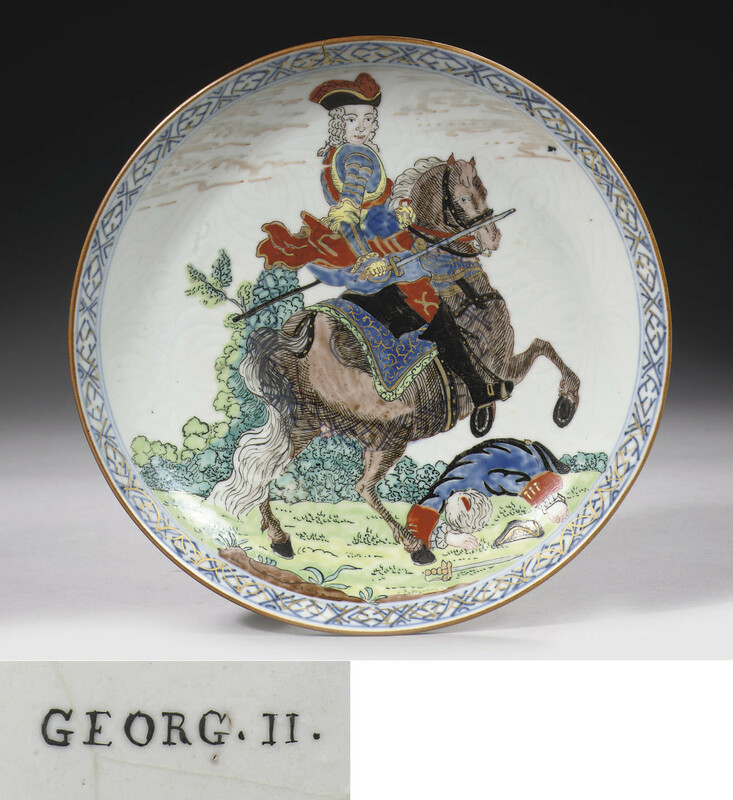 Here the author also explains that an equestrian portait of George II at Dettingen by T. Burford is probably the source for the portrait of George II on this dish. See also F. and N. Hervouët and Y. Bruneau, La Porcelaine des Compagnies des Indes a Décor Occidental, Paris, 1986, p. 390. ill. 16.8.